Sheldon Fox II began teaching at Sandys Secondary Middle School in January 2013. His current responsibilities include the beginning band and advanced band. 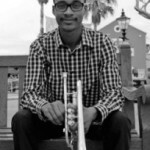 Mr. Fox received his Bachelors degree in music education from Southeastern University where he studied trumpet with Prof. Aric Brian and jazz piano with Daniel E. Joiner. 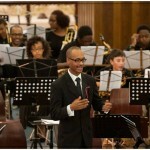 While at Southeastern Mr. Fox performed with the Wind Ensemble, Orchestra, Trumpet Ensemble and Jazz Band. 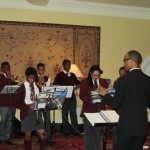 He also studied Conducting, Marching Band Techniques, composition and Instrumental Techniques with various professors. While also at Southeastern, Mr. Fox was selected to play at the 2012 Leadership Forum where he played organ and auxiliary keyboard for the worship choir and SEU Jazz Band. His love for brass banding led him to join the Salvation Army Florida Brass (Florida Divisional Youth Band) where he started out as a solo cornet player and finished on flugelhorn. 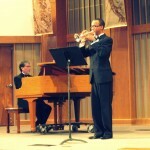 He was later selected to attend the 2014 Composers Symposium at Asbury University. 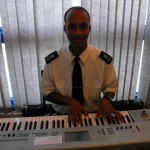 He regularly performs with the Bermuda Regiment Band, Bermuda Divisional Band and enjoys performing as a solo artist. Mr. Fox strives for excellence and the highest performance standards from all of his students while trying to make the experiences of middle school band as meaningful as possible.